The problem of tracking traffic sources is important to any marketing process. Detailed data on the effectiveness of advertising partners is essential for decision-making. A quality attribution system (attributing a conversion to the media source that attracted the user) is an important part of marketing channel analysis. Analyzing the marketing success of a website is a common task. There are many tools available for web analytics, such as Yandex.Metrica. Analyzing performance is more difficult for mobile apps, because the app store stands between the user clicking an ad and installing the app. Conversions (such as app installs). User behavior in the app. Numerous project metrics: retention, number of active users, sessions, socio-demographic data, geography, app stability, and others. 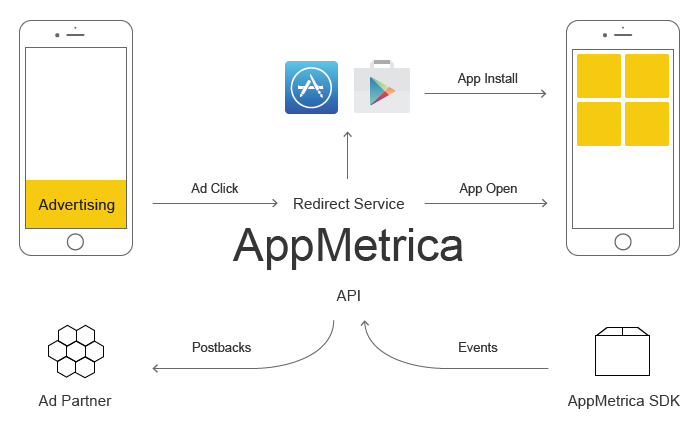 The user clicks an ad and goes to the app store via the AppMetrica redirect service. Then the user installs the app and opens it (the first launch is what is considered the install). The AppMetrica SDK integrated with the app informs the server of the installation. AppMetrica uses a unique technology for tracking installs by creating a connection between the click and the app install for any platform — Android, iOS, or Windows. The advertising partner receives a notification (postback) about the conversion. AppMetrica lets you track the campaign CPI (cost per install) and CPA (cost per action) and optimize them. Tracking is supported for any type of source: organic clicks, mobile internet ads, app ads, or offline ads with QR codes. AppMetrica can also help you improve the performance of your advertising campaign using deeplinks and post-click landings. Since tracking can be flexibly configured, you can use AppMetrica to develop your own unique approach to campaign optimization and create new user scenarios with multiple postbacks and dynamic deeplinks.